Shine with the new Sony Ericsson T700, a phone with slim elegance that will help you stand out from the crowd. This flawless phone combines timeless design and premium features for the mainstream market. Snap a great shot with the 3.2 megapixel camera and share it with your friends on your blog or web page. Boogie to the beat from the exquisite sound of the built-instereo speakers, or through your phone’s colour-matched headset. Be the envy of your friends with the T700. 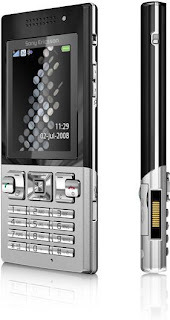 Building on the heritage of the style icon Sony Ericsson T610, the T700 has the robust set of must-have features that you’d expect from a Sony Ericsson phone - but with the slim elegance that takes centre stage in a premium handset. At just 10mm thin this phone has a timeless yet fresh Sony Ericsson design and is complete with a 3.2megapixel camera and self-portrait mirror - ideal for those who are always well groomed and take pride in their appearance and possessions. The T700 is the quick way to add more emotion when you’re in motion. Download film clips and view in vivid colours thanks to the 2” TFT display. The T700 is a slim elegant phone for the mass market – whether you want a phone that looks good or one that is perfect to show off in an important business meeting.